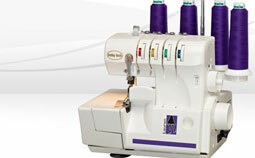 Trims, seams and overcasts 3 times faster than traditional methods of sewing. Serge with 4, 3, or 2-thread for all your serging needs. Differential feed allows you to increase or decrease the fullness in fabric, so you can add gathers or stretch fabric in one step. Provides easy access to those hard-to-reach areas of all your sewing projects, especially cuffs and sleeves. Provides simplified threading and precise tension control. By following the color-coded thread system, you’ll have your serger threaded in seconds.